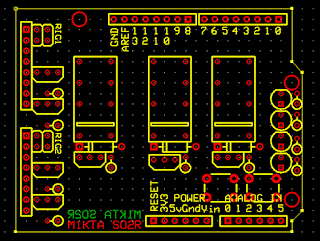 It seemed impossible to find a current project for this that was being kitted and pre-made commercial kit seems way too expensive so in order to make this as small as possible (using through hole) I've put together an Arduino Uno shield. This all started based on the work from NCJ July 2010 by Paul Young, K1XM and then the SO2R box YCCC created. All from a while back and discussions with a quite a few along the way going back a bit. I looked a bit at the stuff M1DST had done too. Design choice was this absolutely MUST only use very common through hole components, nothing unobtainium. 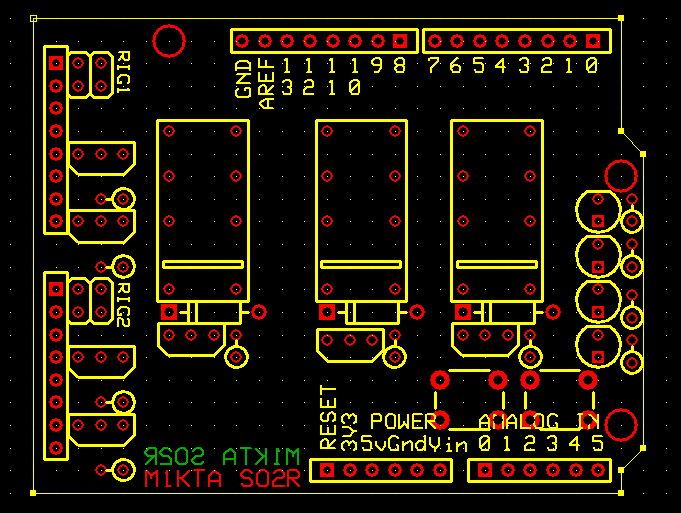 Everything apart from plugs and sockets HAVE to fit on an Arduino Shield. Design choice ALL connections HAVE to be on the outer edges of the board, absolutely nothing in the middle. Those square 4 pad switches definitely got moved. Not complete by a long way and only really a prototype and being a cynic I expect it will get ripped off somewhere which is why not posted all the details this was an early layout and it 100% was re-organised, I just plonked the basic required components on the shield board to see if fitted, no tracks. This has tracks both on top and bottom of the board. What does it do? Well if no PC or Arduino (I added an external power option) you got the ability to MANUALLY switch between 2 rigs .... PTT, CW key, Microphone and Headphones with AF control was all be off board. Honestly nothing is rocket science! It can work like that all manually if you do not want to do anything else, it doesn't need the Arduino and the 'plan' was build it so manually I can switch from rig1 to rig2 if the PC is not there. In my case I used to see if there is an opening etc as I'll have the 2nd rig and separate antenna all setup. Now the extra bit is I kinda followed the OTRSP protocol so it should be usable by Win-Test by sending a command but I have not tested that bit in anger. BTW ZERO band data, as this had to be small and I don't use it anyway so you cannot use this for switching antennas or BPF/LPF/ATU etc It could be added I expect. After a chat with Ash, 3V8SS I added an LCD instead of the LED, meant adding to the Arduino code and only works if the arduino is present and powered. The LED work in either case. The Arduino bit, I munged the code from K1XM and 3V8SS's versions into something this will work with. I am sure using a Nano and SMT components this could probably be made even smaller (and lighter). The isolation of the audio components from ground might be a wise choice if you have group loop issues but not added isolation transformers at this point. My rigs are either separately CAT controlled (or not at all like ATS-3B) with either their own keyer or either a K1EL or KD1JV Simple keyer connected so I didn't include any of those bits either.